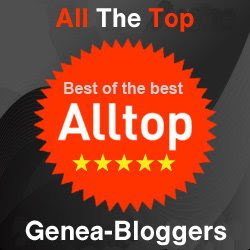 In a recent article on the Photo Detective with Maureen Taylor, Family Tree Blog; Maureen did an analysis of a baby in a carriage being steadied by the hand of what is probably the mother.
. . . but it’s the baby carriage that draws our attention. The first carriage that could be pushed was invented in 1848. Before this, baby carriages were drawn by ponies and other small animals. Newer carriages, like this one, enabled mothers, nursemaids and nannies to stroll with their children. This fringed model looks similar to the horse-drawn surrey carriages used by families in the 1870s. The top would protect the child from the sun. Babies faced front to be admired by passersby. I am very fortunate to have a catalog of baby carriages manufactured by the Children's Carriage Company of Rock Island, Illinois, 1886. The photograph discussed in Maureen's article is grouped with three photographs taken in Moberly, Missouri. As Illinois is Missouri's next-door neighbor, I checked my carriage catalog to see if I could find a carriage reasonably similar -- hoping our Missourians had purchased a carriage manufactured nearby. Here is the carriage that has some similarities, but is not a perfect match. Both carriages are bentwood, both have the fringe top, both have the revolving top, and both have inset front wheels. I can't see enough of the carriage body itself in the photograph to make a comparison between the two. Where the carriages are dissimilar is the carriage handle. The handle pictured here is as wide as the carriage base. In Maureen's photograph the handle is inset. All in all, the carriages are very similar and the one in the photograph may have been manufactured by Rock Island, as Rock Island held the patent for the revolving top. We may never know for certain. Patents from 1790 through 1975 are searchable only by Issue Date, Patent Number, and Current US Classification, information not available to me. A search of Google Patents returned several for Rock Island, but none for the revolving top or this image. The Carriage works was established in 1872. The patent may have been issued anytime between the establishment of the company (1872) and the printing of this catalog (1886). 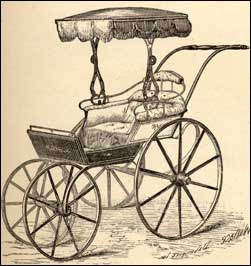 The carriage may have been manufactured between the dates of 1872 and 1886. This was an expensive baby carriage for its day. What cost $8.50 in 1886 would cost $193.25 in 2007. Also, the catalog is listed as "to the trade," so we do not know if the prices listed were wholesale or retail. I will be posting all the images and information on the carriages in future articles. Taylor, Maureen. "Baby Photos." Family Tree Magazine. Photo Detective With Maureen Taylor, 24 March 2008. http://www.familytreemagazine.com/photodetectiveblog/default,month,2008-03.aspx : 2008. Officer, Lawrence H. and Samuel H. Williamson. 2008. "Purchasing Power of Money in the United States from 1774 to 2007." MeasuringWorth.Com. http://www.measuringworth.com/ (accessed 9 April, 2008). Fourteenth Annual Catalogue Of The Rock Island Carriage Company. Rock Island, Illinois : O.A. Barnhart, 1886. Thank you for helping with the identification of the carriage! How lucky you are to have that catalogue - sounds like a treasure! And what a magnificent carriage - far more stylish than the stroller I pushed around. I like the revolving top too. I see an old baby stroller here. Thank you add the picture, I see how the stroller look like at 1886.